Screen printing is a printing technique that uses a woven mesh to support an ink-blocking stencil to receive a desired image. The attached stencil forms open areas of mesh that transfer ink or other printable materials which can be pressed through the mesh as a sharp-edged image onto a substrate. A fill blade or squeegee is moved across the screen stencil, forcing or pumping ink through the mesh openings to wet the substrate during the squeegee stroke. Basically, it is the process of using a mesh-based stencil to apply ink onto a substrate, whether it be t-shirts, posters, stickers, vinyl, wood, or other material. Screen printing is also a stencil method of print making in which a design is imposed on a screen of polyester or other fine mesh, with blank areas coated with an impermeable substance. Ink is forced into the mesh openings by the fill blade or squeegee and onto the printing surface during the squeegee stroke. As the screen rebounds away from the substrate the ink remains on the substrate. It is also known as silkscreen, serigraphy, and serigraph printing. One color is printed at a time, so several screens can be used to produce a multicoloured image or design. The signed & numbered “Desert Inn Baccarat” optimizes the legendary Las Vegas vibe of Del Webb’s famed oasis in the desert during its heyday. The original painting was an icon at the resort casino. The serigraph is a masterpiece of color, visual interest and style. Move your mouse over image In “The Lights of Broadway”, LeRoy Neiman brings together a vibrant collage of the world’s most renowned musicals, and displays them on billboards in the heart of Times Square in New York City. He used black paper to display a nighttime view, and to make the neon colors stand out. If you look closely to the bottom of the page, you will see Neiman in his coveralls standing on an island sketching the beautiful scene you see before you. LeRoy wanted to display a numerous amount of plays that the average person would of at least seen one of or heard of in their lifetime. My Fair Lady was deliberately placed at the top in bright pink, because it was LeRoy’s favorite play. From the foot traffic on every block, to the yellow taxis and fancy cars driving down street & police officers on horseback, Neiman wanted you to get the feeling that you spent a night in city that never sleeps. This piece is a signed & numbered edition with 313/450 in the bottom left hand corner, and LeRoy Neiman’s signature in the bottom right hand corner. 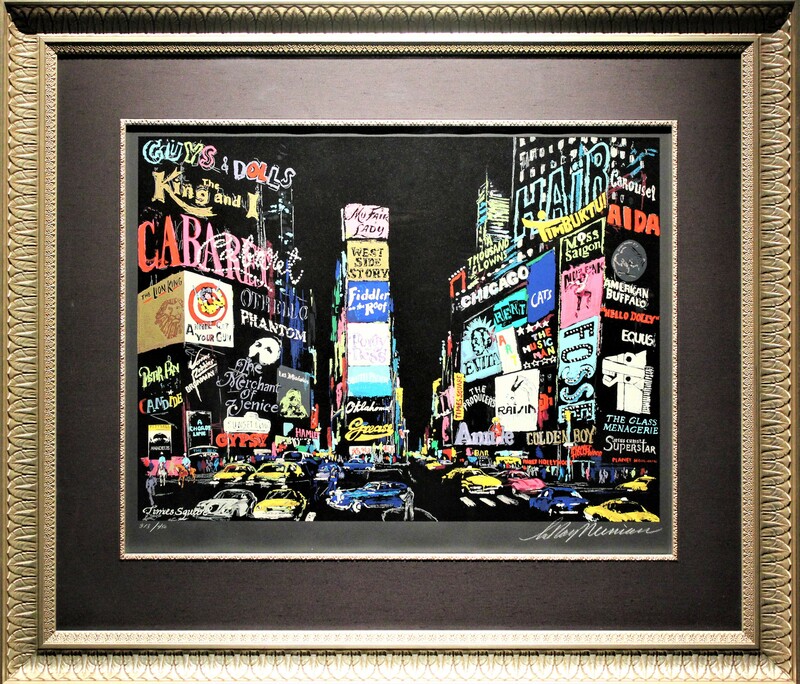 Call now to speak with a live Centaur Art Gallery representative about the rare “Lights of Broadway” or any other artistic work by LeRoy Neiman– (702) 737 1234 or visit our showroom. Centaur Art Galleries of Las Vegas has the largest exhibit of LeRoy Neiman’s artwork on display. LeRoy Neiman was an American artist who lived between 1921 and 2012. He is known for his use of sriking colors, and is well known for paintings of leisure life and athletic competitions such as the Olympics, the Super Bowl, the World Series, championship boxing, PGA ant the Masters golf tournament, entertainment, and gambling to name a few. Neiman’s “Celebrating 100 years of Neon” produced in 2005 was commissioned by the Las Vegas Convention and Visitor Authority through Centaur Art Galleries. “Celebrating 100 years of Neon” is a plate-signed serigraph with a total edition size of 500, of which 250 are hand-signed. The screen print is a collage of typical scenes you will see in Las Vegas, the show girl and the cowboy and you can’t forget about the gambling. At the top of the serigraph is the well-know “Welcome To Fabulous Las Vegas, Nevada” sign. Above the sign reads 100 YEARS 1905 – 2005. The name Neimen gave the painting, “Celebrating 100 years of Neon,” is interesting. On May 15, 1905, Las Vegas was officially founded a city. In Las Vegas, we have the Neon Museum. The Neon Museum is where all of the old Las Vegas signage goes to retire. The museum didn’t officially open until October 27, 2012, but the point giving the background to the museum is Las Vegas is known for its neon lights. 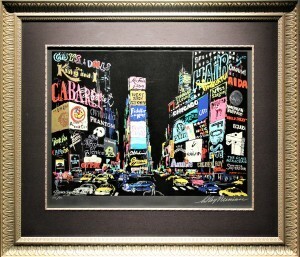 You can also see many of LeRoy Neiman’s other brilliant pieces inside Centaur Art Galleries of Las Vegas. 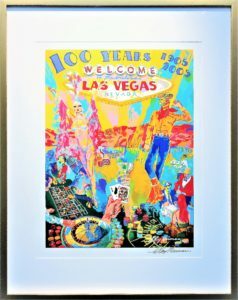 Call now to speak with a live Centaur Art Gallery representative about “Celebrating 100 years of Neon” or any other artistic work by LeRoy Neiman – (702) 737 1234 or visit our showroom. 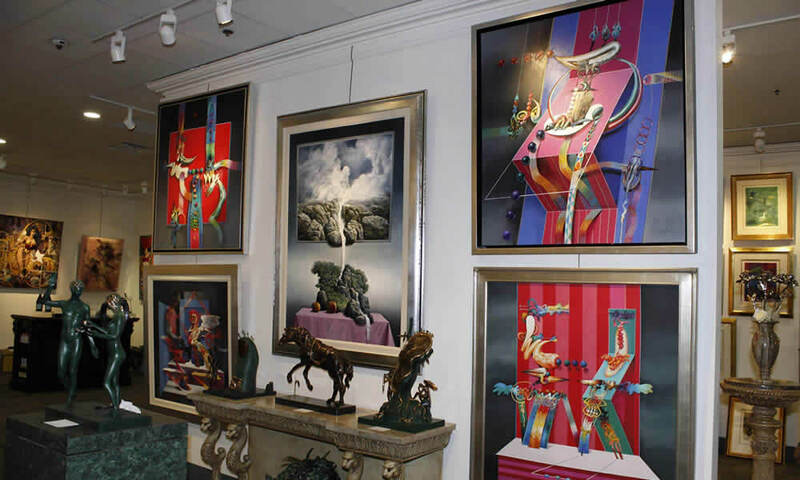 Centaur Art Galleries of Las Vegas has the largest exhibit of LeRoy Neiman’s artwork on display. LeRoy Neiman was an American artist who lived between 1921 and 2012. He is probably one of America’s most popular artists because he was the official artist at five Olympiads. 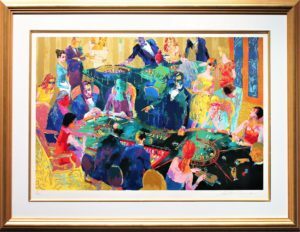 One of Neiman’s oil paintings depicted in 2008 is “High Stakes Blackjack- Vegas” displayed in Centaur Art Galleries of Las Vegas, NV. 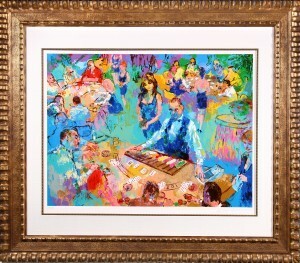 Centaur Art Galleries of Las Vegas has serigraph 190/250 numbered impression signed in pencil in the lower left hand corner by LeRoy Neiman. LeRoy Neiman is best known for his use of striking colors and his lively scenes of sporting events and leisure activities. He interpreted the life he knew. The setting of the serigraph is a Las Vegas casino. The viewer’s attention is brought to the center table where the dealer and the many gamblers are playing the game of “21.” The gambler’s faces are expressionless to portray their “poker faces.” Neiman has a great talent for making the observer feel a part of the scene. “21” is a fast moving game. Neiman has a very sudden style about his artwork. His style helps give the observer the impression of the rick associated with the game. Some debate the scene depicted is inside the MGM Grand. You can also see many of LeRoy Neiman’s other pieces inside Centaur Art Galleries of Las Vegas are center around the lion. The MGM Grand has a lion habitat and much of its entertainment includes the lions. 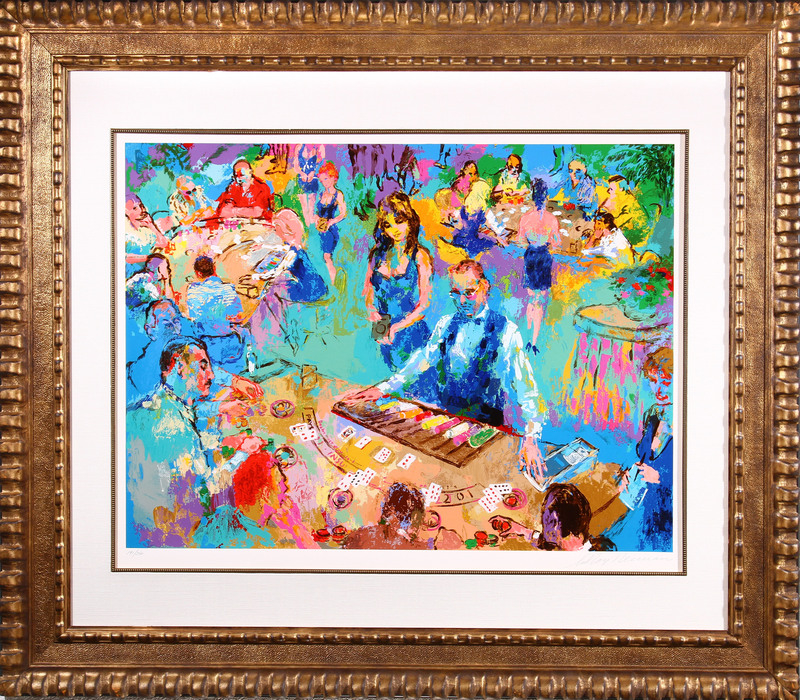 Call now to speak with a live Centaur Art Gallery representative about “High Stakes Blackjack – Vegas” or any other artistic work by LeRoy Neiman – (702) 737 1234 or visit our showroom.